Completed in 2001, the Gaia Building was the first mixed-use project built in downtown Berkeley by a private developer in decades. Eight floors of low-income and market rate housing around a central courtyard rise above a podium containing retail and garage space. 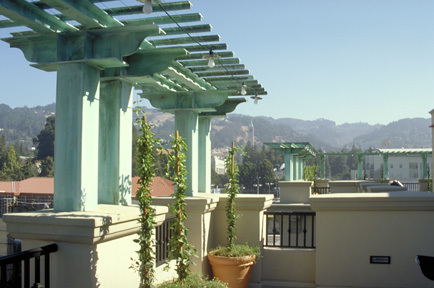 The stepped roof has over 9,000 square feet of landscaped and furnished terraces on two levels, with unobstructed views of San Francisco, UC Berkeley, and the Golden Gate Bridge, as well as a large solarium available for public use. The basic form of the building is inspired by early 20th century industrial and commercial structures, with simplified classical details and expansive steel ‘factory sash’ glazing. The top floor terraces, trellises, and pavilions reflect the Architect’s observations of the rooftops and skyline of Rome.